Water Center sponsors 2019 Virginia Water Monitoring Council Conference to be held April 10th in Henrico, Va. This one-day conference includes invited speakers who provide current information about water monitoring and watershed management. Participation in the VWMC conference is open to VWMC members and the public. See the conference webpage for more information and to register for the conference. Ann Jennings is the Deputy Secretary of Natural Resources for the Chesapeake Bay under Secretary of Natural Resources Matt Strickler in the office of Governor Ralph Northam. 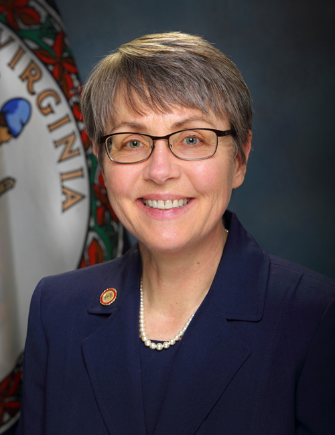 Prior to her current position, she was the Virginia Director of the Chesapeake Bay Commission. Ann has also served as the Virginia Executive Director of the Chesapeake Bay Foundation and worked as a biologist with the U.S. Fish and Wildlife Service. Originally from Virginia Beach, Ann received a bachelor’s degree in biology from Virginia Tech and a master’s degree in wildlife and fisheries sciences from Texas A&M University. Ann is a graduate of the Virginia Natural Resources Leadership Institute and the Sorensen Institute’s Political Leaders Program. REGISTRATION: Includes morning coffee, lunch & snacks. Registration requires completing the online form here and paying via check or credit card. No refunds after March 15, 2019, but substitutions are allowed. · Early Bird Fee (until 5 p.m. on Friday, March 15, 2019): $65. QUESTIONS? See the VWMC website at www.VirginiaWMC.org for more information or contact Katie Register, Clean Virginia Waterways of Longwood University, 434-395-2602 or registerkm@longwood.edu.